2018 is set to be a big year for ViaData and Travelyst. We ended 2017 with Club Travel Retail and Sure Giltedge Retail signing up for Travelyst, and kicked off 2018 with another new Travelyst client in East Cape Tours. Very soon these companies will be experiencing the benefits of a fully integrated Travel CRM and Management system that will enable rapid but controlled growth. The Travelyst team are working hard to get these clients up-and-running by the end of Q1 2018 and are looking forward to a busy and productive year ahead. After some introspection a common theme from all our staff was that what makes us different is that we aim to build systems that will last FOREVER. Forever is a long time, but it is amazing how a mindset like that can shape everything you do. We realised that while we may never have formally expressed it, for a long time this has been our driving thought – so we have now adopted it formally. To assess how well we are doing at living to this mission statement, we asked some of our customers what they think of Catalyst and ViaData. This response came from Roz, one of our newest clients. “Moving over to Catalyst has absolutely positively changed the way we work! The Catalyst framework is robust, reliable and easy to navigate and intuitive to use. The efforts and support from ViaData has been fantastic! The data transfer from old to new was relatively trouble free, despite the mess that some of the original data was in. All our data was transferred accurately and we have therefore been able to seamlessly transfer and have retained the integrity of our information. In addition, ViaData has improved our tools and workflows which has, among other things, allowed us to perform our tasks with far less manual intervention. We rarely have to wait long for new features to be added or bugs to be resolved. In our case, we had data scattered around in ill-maintained and stagnant in-house built databases/tools – with no maintenance and no hope of making improvements or changes. Catalyst is maintained professionally and we have the option to make improvements and changes on a daily basis! Not only that, but we have the option to create new modules to aid other areas of the company and automate their processes. All this in one neat, tight, reliable, ever growing and improving package. Travelyst caters to the travel industry with a deeply integrated Customer Relationship Management (CRM) component. “Don’t know how we ever kept on top of things before, I start and end my day on Travelyst – so easy to monitor what’s going on in the business!” – Edwina Fletcher, Managing Director, Webtours. If you are a travel agent or tour operator, please give us a call for a free demonstration and discussion about the advantages of moving to Travelyst, including a “from the mouth” discussion with our clients that have already implemented Travelyst. Please contact us for more information about Travelyst. Travelyst is offered as either a “CRM” version or “Premium” version which increases flexibility for the client for both budget and transitioning your business processes into the Travelyst environment. Travelyst CRM comes standard with the main features for enquiry management, customer lifecycle management and quote version management. Travelyst Premium adds Travelyst CRM all functionality required to build detailed itineraries, produce documentation and integrate with a financial accounting system. Travelyst is a turn-key, cloud based solution which requires no additional hardware/infrastructure costs. With a user-friendly interface, it is simple for everyone to start using from day one. Customers need a secure connection to the internet. The system is offered on a monthly subscription fee per user. The support team at Travelyst is available from your first purchase to assist with the installation, setup and training for each station and is available thereafter for any support related queries. ViaData has been working in the tour operator business since 2009 and we know the travel business very well. Travelyst is currently in use at 3 major tour operators across 10 brands in South Africa. ViaData continually adds new functionality and features to Travelyst to keep the system current and to enhance the user experience and productivity of our clients. They are delighted! Remember, these are just the highlights, and Travelyst has considerably more functionality. To find out more, or to arrange a free demonstration, please contact us! Travelyst is a cloud-based Travel and Tour Operator business-process software solution that is differentiated by having a very strong integrated travel-oriented Customer Relationship Management (CRM) component. The CRM module delivers functionality similar to stand-alone CRM applications with the added benefit of a deep Travel Agent/Operator focus. The CRM component of Travelyst is extremely efficient. Most travel agencies receive their enquiries into a common email box and then use a variety of office tools to distribute these enquiries to their consultants. Travelyst, however, provides a single interface from which consultants operate. Travelyst is designed to manage the entire client interaction and consulting process, as a central hub for email, spreadsheets, all documentation, file systems and multiple travel applications from one central point. In the world of travel and tour operators, it is nearly impossible to find a business application that fulfils all the functions essential to work effectively. Travelyst provides an end-to-end solution that fulfils all your operating requirements. ViaData continually adds new functionality and features to Travelyst to keep the system current and to enhance the user experience and productivity of our clients, and they are delighted! Travelyst, our end-to-end Travel and Tour Operator Business Solution, has moved to greener (and much faster) pastures. For the last 2 ½ years, Travelyst has shared space with our other systems and business applications. It was getting crowded and as a mature application, Travelyst wanted to leave the nest, spread its wings, find its own home in the world, and soar. Response times on Travelyst have been slashed by about 90%! Throughput on all Travelyst websites is up by 50%! Best of all, our client’s user satisfaction has absolutely soared! We have great plans for Travelyst in 2017 and we are very excited about Travelyst’s value to our clients! Just as we moved Travelyst to its own dedicated server, ViaData continually adds new functionality and features to Travelyst to keep the system current and to enhance the user experience and productivity of our clients, and they are delighted! To call us, find out more, or to arrange a free demonstration, please contact us! Travelyst is ready for prime time! The excitement has been steadily building and now, after nearly 2½ years in development, Travelyst has been released to the market! Travelyst has been battle-tested in a live production environment throughout its development and testing phase and has won high praise from its users. Since its release, Travelyst is already live with our first two new clients and they are delighted! “Very user-friendly and self-explanatory. Travelyst has a wonderful way of reminding you concerning follow-ups” – Bronwyn Lambrecht, Perfect Destinations. Travelyst fills a large gap in the Travel management and Tour Operator market, as travel solutions in use in South Africa in general don’t focus on CRM functionality. Generic CRM solutions don’t have enough travel-specific functionality to support integration into itinerary building and the highly iterative quotations and consulting process that occurs when selling travel products. We’re very excited about Travelyst, because this is where Travelyst shines! We’ve hired additional staff to specifically support the implementation and rollout of Travelyst and we are engaged with planning some significant implementations in the next 12 months. “Travelyst makes the process so quick and streamlined for us; the copy and paste of the PNR is the best invention EVER!” – Shona Pittaway, Managing Director, Perfect Destinations. Remember, these are just the highlights, and Travelyst has considerably more functionality. To find out more, or to arrange a free demonstration, please visit our contact page! We are the Keystrokes, a team of 4 Honours students majoring in Information Systems. The team members include Shestine Haripershad, who is also the team leader, Anny Fang, Jeronisha Chetty and Natheer Davids. We will be developing a mobile application for ViaData, called Travelyst, for our Systems Development Project this year. I am currently doing my Honours in Information at the University of Cape Town. I completed my undergrad at UCT and started off majoring in Computer Science and Information Systems. I realised that I wasn’t particularly interested in Computer Science as it was a bit too technical for me. I was more interested in how technology, more specifically systems, could improve the way a business runs. I was drawn to Information Systems as it focuses both on a business aspect as well as the developing of applications or systems. I enjoyed developing Web Applications and Mobile Applications in my final year of undergrad. It had made me discover that I am really passionate about front-end design. I find it very enjoyable and could spend hours trying to perfect a user interface. I am looking forward to my Honours year as well as working with ViaData on the Systems Development Project. I am a 22-year-old BCom Honors IS student at UCT. I did my undergraduate degree at UWC where I initially majored in statistics and economics but ended up graduating with an IS major, funny how things work out. I have never really done a blog up until this year, where apparently doing one weekly becomes the norm, although I still struggle to conceptualise the correct things to say, especially about myself. Anyways, I am a Muslim, I am quite interested in topics related to ICT4D, I wrote a mini-thesis on Electronic Medical Record (EMR) system adoption in the Western Cape and am currently doing another mini-thesis on the accessibility of e-government websites for the visually disabled, other than that the progression of e-commerce is quite interesting, I tend to be quite business orientated I suppose that’s down to what I learned in my undergrad and the environments I’ve been exposed to. I love football (the British version not the one American’s play where they use their hands), I am a little bit of a gamer and I occasionally surf (waves not the internet). I am currently completing my Honours in Information Systems (IS) at the University of Cape Town. I believe that Honours in IS is particularly valuable because it allows students to engage with people in the industry throughout the year. The IS Department has ensured that IS students understand the industry, current market trends, how businesses operate and how Systems Development projects are carried out. I enjoy coding mobile applications and researching current affairs. I am currently researching cyber security awareness amongst the average person in South Africa which I think is relevant given the adoption of technology into everything we do. My name is Anny Fang and I am currently an Information Systems (IS) Honours student at the University of Cape Town (UCT). I started my undergrad at UCT majoring in Computer Science and Chemistry in the Science Faculty because I had enjoyed Information Technology and Chemistry in high school. I failed Chemistry in the first semester of my second year and decided to take IS as my second major later in the year. I enjoyed IS and gained experience working with clients in our final year project, where we had to analyse an organization’s current processes/operations and find ways to improve them. One of my hobbies is playing badminton. The students will be developing a mobile application for ViaData’s Tour Operator Software, called Travelyst, which will automate some of the processes currently implemented by ViaData. The mobile app for Travelyst will be a travel app that retrieves custom made itineraries for a specific user, and saves it to their local storage (cellphone). This will decrease the amount of documents that a traveller would need to carry around. The app will also make sure their itinerary is up to date if any changes are made. The app will incorporate a messaging function between the traveller and the consultant so when issues or changes arise during their travels, they can easily communicate with the consultant. There will also be the ability to rate a service such as a car hire or a hotel. This will allow ViaData to capture user feedback. We are also going to let the mobile app link to Google Maps and TripAdvisor. Google Maps will allow travellers to find their way in a foreign country and TripAdvisor will allow them to see any exciting events happening in the area they are in. As ViaData, we will be following the Keystroke Team as they develop a mobile application for ViaData’s Travelyst Tour Operator Software. All the ups and downs, frustrations and breakthroughs will be blogged as they travel the road to success over the coming months! We wish them all the very best and good coding! There are currently no platforms available in which travellers and travel consultants communicate directly with each other to manage a traveller’s documentation, itinerary and other information. Therefore, ViaData came up with the idea of making a mobile application for the front end of their Travelyst Tour Operator Software to achieve this goal. With this in mind, ViaData approached the University of Cape Town as they have supported software related student projects for many years. The project was born so that ViaData and the students could learn while exploring the possibility of a mobile application for Travelyst. A bi-product of this exercise may be a very usable mobile application that ViaData can ‘productionise‘ or have a good proof-of-concept that can be used as a prototype for a final mobile product in the future. The Travelyst mobile application will allow for the traveller to receive all their travelling documentation electronically and any changes made to their itinerary will be shown immediately via the Travelyst mobile app. It will also enable direct communication between a traveller and a travel consultant. This will be done on a single platform and will be instantaneous. The traveller will no longer have to communicate via email or multiple platforms to achieve a task. Some of the hurdles the team will have to overcome will include time management. 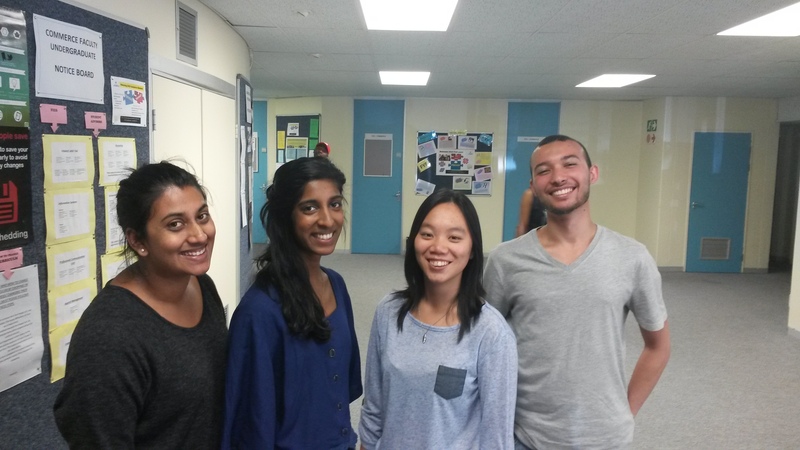 They are involved in tutoring at UCT, community service as well as other courses. Therefore, they will be pressed for time which can be overcome with good planning. The team want to develop the mobile application using Phonegap software which could be a potential hurdle. None of the team has worked with this technology before and there is not much assistance available, other than the internet. They are very motivated however and determined to learn so that they feel confident using Phonegap. One of the last hurdles is integration. The team need to integrate the app with the current ViaData Travelyst backend system as well as integrating it into social media. The UCT Keystroke Team are currently working on the Web Service call. The Web Service call is necessary in order to connect to ViaData’s Travelyst database. ViaData has started doing the initial work on the Web Service call and the team are starting to configure the architecture from their side so they can retrieve data from the Travelyst database. The database is hosted in the cloud by Internet Solutions and has a guaranteed uptime to ensure that travellers will always have instant access to the information they require. As part of ViaData’s “Improving Every Day” ethic, we’ll be updating you as the students progress in developing the mobile front end to ViaData’s Travelyst Tour Operator Software. We hope you’ll enjoy the ride!